KeysRCool now Offers “Kelloggs” House Keys and Key Chains. KeysRCool, offering over 700 types of key designs, is pleased to announce the addition of the “Kelloggs” house keys. Evans, GA 29 June 2014 – KeysRCool, offering over seven hundred types of key designs, is pleased to announce the addition of the “Kelloggs” house keys. KeysRCool offers keys which fit the popular kwikset and schlage locks. These key blanks are really cool and unusual. These keys are becoming very popular and collectible! They are great for keeping your keys organized by design! Keys can be cut at a local locksmith or hardware store. The “Kelloggs” painted design covers a brass key. The powder-coating prevents the design from wearing off. 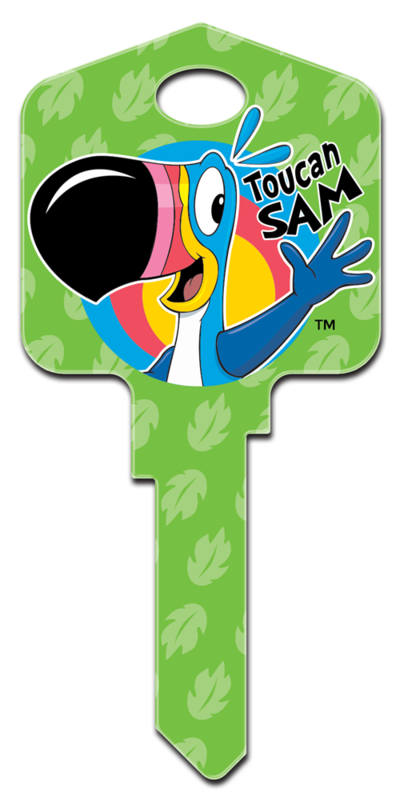 KeysRCool offers five “Kelloggs” designs: Keebler Elf, Snap Crackle Pop, Tony the Tiger, and Toucan Sam. These keys are great for keeping your keys organized by design! These “Kelloggs” keys are becoming very popular and collectible! These are really cool and unusual key blanks. They are sure to dress up your key chain without breaking your budget. The keys fit the popular kwikset and schlage locks.